European corn borer (ECB) adults are increasing in blacklight traps in parts of southern and central NJ now. 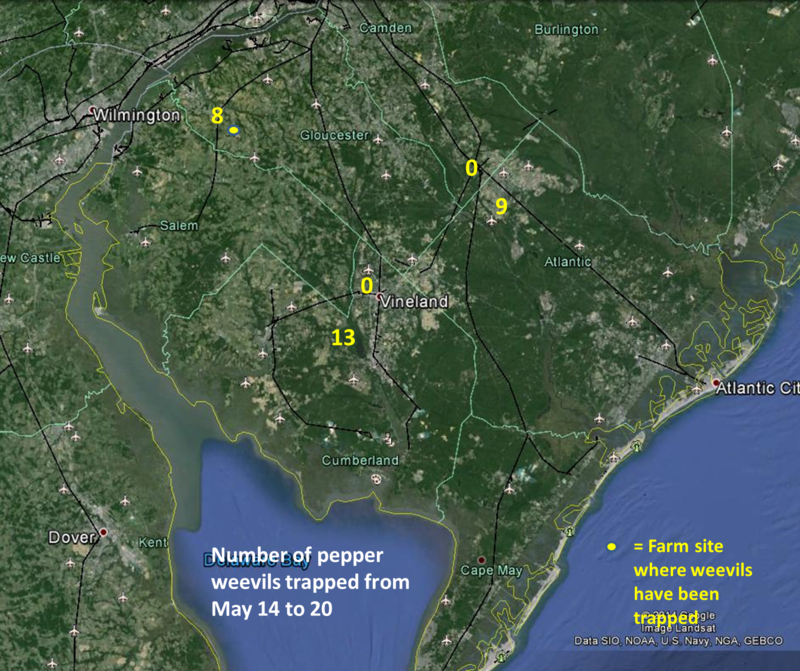 The most consistent catches are in parts of Camden, Gloucester and Burlington counties (see ECB map). The recent trend to warmer weather has brought on these catches, and if reasonably warm weather dominates, we would expect catches to increase over the next 2 weeks. If rains and cooler weather lasts for the next several days, activity may be delayed. No larval infestations in sweet corn have been reported as yet. Early plantings are now in the whorl stage however, and within a week, feeding may begin on these plants. Consider treating if 12% or more plants exhibit the characteristic “shot-hole” type feeding on leaves. It is not too early to consider ECB management tactics on later stage sweet corn. Remember to make a full-tassel application to control ECB larvae as they leave the tassel and travel down the stalk to re-enter the plant near the ear shank. This last application is often critical to controlling ear infestations from ECB. Two corn earworm moths (CEW) were captured in blacklights at Crosswicks in Burlington County and at Woodstown in Salem County this week. These individuals may be the result of prolonged southerly winds in advance of last Friday’s slow moving frontal system. These moths typically do not represent a threat, as silking sweet corn is not present. As the first plantings go to silk, and we are capturing CEW even at low numbers, the danger of infestation will be significant. As silks begin to appear, pay close attention to CEW catches in local blacklight traps, and treat silking plantings accordingly. Heavy egg laying by imported cabbage butterflies (ICW) is occurring at this time, and will continue as warm weather permits their activity. Infestations of this pest have been found in the central counties, and are certainly present further south. Scout plantings weekly. Check 5 consecutive plants each in 10 random locations throughout the planting, paying particular attention to the innermost leaves where ICW often feed. Consider treating if caterpillars are found on 10% or more plants that are in the 0-9 true leaf stage. From 9-leaf to the early head stage (in broccoli, cauliflower and cabbage) infestations up to 20% may be tolerated. Once heads begin to form, a 5% threshold should be observed to protect the marketable portion of the plant. For leafy greens such as collards and kale, 10% plants infested is the threshold throughout. Pepper transplants are now going into fields. At the same time, the first ECB flight is increasing. Be sure to scout fields regularly for the presence of ECB egg masses. If two or more egg masses are found in a 50 plant (two leaves/plant) sample, consider treating even if no fruit are present. In the absence of fruit, ECB larvae will bore into the central stem, topping the plant. This will result in the loss of crown fruit on infested plants. Generally, where blacklight trap catches average one or more ECB per night (blue and green areas on the ECB map) and fruit are greater than ½” in diameter, insecticides are warranted. See the 2014 Commercial Vegetable Production Recommendations for materials useful in controlling ECB. When choosing insecticides with efficacy against ECB, be aware that component products (products that combine more than one active ingredient) often contain only one active ingredient that controls caterpillars. Generally, this active ingredient is also recommended as a stand-alone product. If there are no other pest concerns, it is best to utilize the single effective product for caterpillar control. This avoids negative impacts on beneficial insects and does not contribute to insecticide resistance in non-target insects. Two-spotted spider mites (TSSM) are a common pest in high tunnel tomatoes at this time. Hot weather favors TSSM, and may also reduce the activity of insects that prey on TSSM. Check 2 complete leaves each, on 5 consecutive plants in 10 random locations in the planting. Look for the presence of whitish “pin-spots” on the upper surface of leaves. These spots appear in response to TSSM feeding on the lower surface. As TSSM increase, spots will coalesce to form a yellow area on the leaf surface. If not managed, TSSM will cause leaves to become bronze in color and may kill the plants. Make sure some samples are from tunnel edges. Spot treat, if possible. Do not wait until TSSM is widespread throughout the field, as it will become more difficult to manage. Consult the 2014 Commercial Vegetable Production Recommendations for labeled materials. The predatory mite Neoseiulus fallacis can be effective at suppressing TSSM, however temperatures regularly reaching the mid-80°F range create an unfavorable environment for N. fallacis. This results in poor control, and loss of the predator. Ideal use of predatory mites for TSSM management is under early season conditions when temperatures are not higher than 80°F outside the tunnel. Pepper growers with fields near (up to 1 1/2 miles) any produce handling facilities should consider spraying their peppers with the first set of flowers/fruit to kill adults before egg laying begins. Several insecticides can be applied that would be effective against the adults. Refer to the list of recommended insecticides in the 2014 Commercial Vegetable Production Recommendations. Spraying at this time will potentially prevent early field infestations. 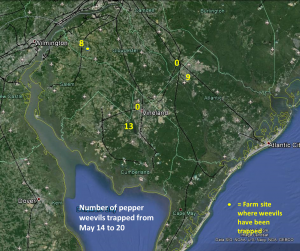 While the overall pepper weevil counts are down this past week, the counts from the pheromone traps for the year, so far, are much higher than last year (see Pepper Weevil Trap Catch Map). Only a few BMSB adults have been captured in blacklight traps thus far. As adult captures increase, maps will be produced to show where activity is highest. Information on scouting, crop injury and control will also be included.